Sidney Slon/Staff Photographer Senior forward Caleb Stewart anchored BU’s defense with seven defensive rebounds, seven points and four rejections in its win over Sacred Heart this weekend. 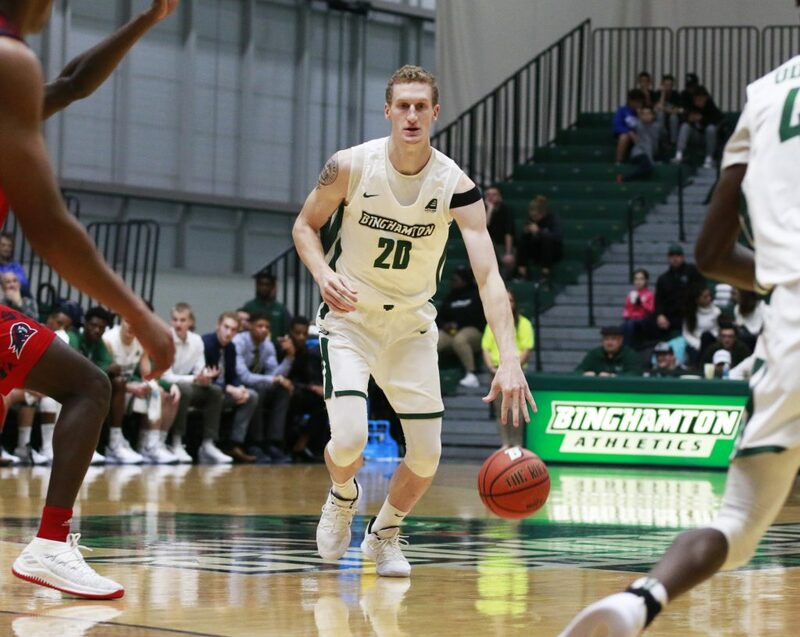 This Saturday, the Binghamton men’s basketball team took on Sacred Heart University at home. An exciting, tightly contested showdown, the Bearcats (2-4) defeated their opponent by a margin of just five points, claiming victory, 78-73. BU’s offensive effort was led by freshman guard Sam Sessoms, who scored 19 points, while senior forward Caleb Stewart anchored Binghamton’s defense with four rejections. The Bearcats began the night by going on a 10-0 run, featuring two successive baskets in the paint from Stewart. These points were followed by two three-point shots, the first from graduate student guard J.C. Show and the next from junior guard Richard Caldwell, Jr. Sacred Heart (2-4) earned its first two points of the game courtesy of a shooting foul called on Caldwell, Jr. Eager to stay in the game, the Pioneers rallied offensively to finish the first half with a one-point lead, up 33-32. The second half began with two missed three-point chances from both teams. Catching a defensive rebound, Show found Sessoms in the paint to give BU a one-point advantage. Seconds later, Sacred Heart responded with a basket of its own as redshirt junior forward Jare’l Spellman slammed the ball through the net on the opposite end of the court via an assist from freshman guard Cameron Parker. On the Bearcats’ end, Show quickly drained a three-point ball to give BU a two-point cushion. Another dunk from Spellman, courtesy of freshman guard Aaron Clarke, tied the game at 37-37. An additional inside basket from Sessoms again gave Binghamton an edge. The teams continued to battle, and while the score was close at times, this lead was the one that BU maintained for the remainder of the game. The Bearcats entered Saturday’s game ranked fourth in the nation in blocks, averaging seven blocked shots per game. On Saturday, the team finished with 11 blocked shots from five different players. Up next for BU is a game on the road at Army on Wednesday, Nov. 28. Tipoff is scheduled for 7:30 p.m. from the Christl Arena in West Point, New York.